We’d love your help. Let us know what’s wrong with this preview of El silencio es un pez de colores by Annabel Pitcher. Annabel Pitcher vuelve al universo juvenil con El silencio es un pez de colores, una emotiva novela sobre la búsqueda de la identidad. Tess siempre se ha sentido fuera de lugar, y la noche en que lee por casualidad l Annabel Pitcher vuelve al universo juvenil con El silencio es un pez de colores, una emotiva novela sobre la búsqueda de la identidad. To ask other readers questions about El silencio es un pez de colores, please sign up. Is this book better suited for middle schoolers or teenagers? This was a YA contemporary story about a girl who stopped talking. I felt quite sorry for Tess, the information that she stumbled across on her dad’s computer was quite sensitive, and to find out in such a harsh way couldn’t have been easy for her. The storyline in this was about Tess suddenly stopping talking as a form of protest, and I totally got why she did it. I did find the way that she talked to a plastic goldfish flashlight in her head a bit weird though! The ending to this was pretty good, and I was satisfied with the way things worked out for Tess. I started this book this morning when I woke up, roughly 5 hours ago. I flew through it. Once I picked it up I couldn't put it down. This story is so poignant and honest, heart-brachingly so, and I connected with it and the main character, Tess.The author has managed to capture the thoughts of Tess perfectly: a teenager who is lost and feeling helpless, not sure where to turn to or who to trust with what she's feeling and thinking. It's a true coming-of-age novel. It explores the ups and downs o I started this book this morning when I woke up, roughly 5 hours ago. I flew through it. Once I picked it up I couldn't put it down. This story is so poignant and honest, heart-brachingly so, and I connected with it and the main character, Tess.The author has managed to capture the thoughts of Tess perfectly: a teenager who is lost and feeling helpless, not sure where to turn to or who to trust with what she's feeling and thinking. It's a true coming-of-age novel. It explores the ups and downs of the family dynamic, misunderstandings, bullying, and infidelity all from the perspective of someone who is caught in the middle of it all, and is struggling get through it all on her own. Tess is a great character. A bit naive and stubborn in her ways, but as a teenager myself, I can say that it comes with the territory. She has recently found out that her dad isn't her biological father, but she found out in a way only known to her, and it hurt her greatly. She becomes angry and lost, and stops talking. She finds comfort in the fact that through her being mute she doesn't have to ask the questions that weigh so heavily on her mind, or answer to seemingly trivial things when all she wants is to rage. With silence as her new companion, along with a flashlight in the shape of a goldfish (which she lovingly dubs "Mr. Goldfish"), she starts the search for her true father, and her place in a world she feels has just betrayed her. A few weeks into her silence Tess gets a new math teacher, Mr. Richardson. They share almost the exact same physical qualities, and Tess is convinced that he is her true father. This is really where the story begins and the plot really starts to advance. I really liked how this book managed to touch on a lot of serious issues and still keep to the storyline without seeming to get off track. Tess is bullied a lot in school, and throughout the book you see how she becomes stronger because of that and ultimately shows the bullies that she is above them and that their insults don't hurt her any longer. With body issues being such a big topic in society today, it was great to see how Tess didn't let those comments get to her, and even expressed how she liked who she was and what she looked like throughout the novel. That was empowering to me. There's also the plot twist with Mr. Richardson, but for sake of spoilers I'm not going to get into that. Just know that he is sketchy. Very, very sketchy. The side characters in this book also really shined. Isabel, Henry, Ms. Gilbert, Mr. Goldish, even Tess's parents were all essential to the story and I enjoyed reading about them and their interactions, how they each fit in a place in Tess's life. One thing I found a bit odd though was the deal with Mr. Holdsworth, the previous math teacher. He was a main point in the summary I read for this book, but he wasn't involved in practically any part of the story. I wasn't sure of the point of him? I wandered familiar streets feeling lost in the darkness, too scared of the stuff inside my head to be afraid of anything outside it. And now here I am with a plan that involves a goldfish, who looks shocked because this is not at all what he thought was going to happen when he woke up this morning next to the bottles of de-icer at the Texaco Garage that is the only home he’s ever known. Tess has just read something shocking. Six hundred and seventeen words in which her father revealed that he wasn’t actually her father, and that his first feeling when she was born was one of disgust. Tess wasn’t meant to read this, and her father… no, not her father, Jack, doesn’t know she saw it, doesn’t know why she’s suddenly stopped talking and is refusing to follow instructions. She’s defiant, she’s distant, she’s possibly lost it. There were a lot of interesting themes within this novel, and it had the building blocks to make something amazing, but it came together as a rather uneven story. Multiple things within this novel suggested that, perhaps, the main character might have started out as a lot younger, and been aged to fit slightly more adult themes. The rest of this review can be found here! There must be a list on the Internet of what to buy when you're running away, but my phone is typically dead, like I swear it just passes out whenever things get stressful. It's unconscious in my pocket so I can't look up a list of essential items for life on the road, but a children's torch in the shape of a goldfish seems a very sensible choice. Tess Turner has just discovered something terrible. She read her dad’s blog and six hundred and seventeen words later her world is kind of coming apart at the seams. Soon she retreats into a world of silence, communicating only with her plastic goldfish torch, as she tries to make sense of what she’s found out. I liked the theme of the book, which was all about identity and how where we come from shapes who we are. There’s also the nature versus nurture debate and the question of what constitutes a ‘real’ parent - the person whose DNA you share, or the person who raised you? These questions are dealt with in depth, albeit through the eyes of an emotional fifteen year old. And this brings me on to Tess. Unfortunately I didn’t find Tess very relatable. I think maybe it’s because she’s only fifteen, and a fairly immature fifteen, but this felt more like an MG novel than YA, especially the internal dialogue with her goldfish torch. She was a bit self-pitying and instead of just questioning her parents about what she had read (and she seemed to have a fairly strong relationship with her parents, even though her dad was a bit of a prat), she just bottled everything up. What she found out was shocking, no doubt, and it would have taken some getting used to but at the end of the day she still had two parents who were invested in her. People go through worse and manage to deal. I don’t know. Maybe it’s because I’m very much on the side of nurture that I struggled to see Tess’s viewpoint. Your parent is the person who changes your nappy, sits through your nativity play, tells you you’re gorgeous when you look like a minger, nurses you through chickenpox and norovirus and show up every day. The casual way Tess ignored everything her mum and dad had done for her (her dad’s knobbishness notwithstanding) annoyed me and after the three amazing characters Annabel Pitcher put together in Ketchup Clouds, this felt a little disappointing. And don’t get me started on the instant, all-consuming fixation on the supply teacher she becomes convinced is her real dad. Really not sure where that came from. I’ll tell you who I did like, though - Isabel. She was cool. I liked her very much. She was uber geek and proud of it (correct) and funny and loyal. I was glad she was included in the book, not only because I always like to see non-toxic female friendships but because she reminded me that this author really can do quirky, totally real characters. Awesome. More like Isabel, please Ms Pitcher. I think I have the maturity of a teenager as this book—and its language—very much appealed to me. In fact I was pretty much hooked from the opening page. Tess's an outcast. After reading the book I read some reviews in Goodreads and noted that some peeps there really disliked her character. I was surprised. I found her endearing. Of course I am much older and could probably sympathise with her a lot. She's a loner but has lied to her parents about her friends. Her dad in particular has been keen I think I have the maturity of a teenager as this book—and its language—very much appealed to me. In fact I was pretty much hooked from the opening page. She's a loner but has lied to her parents about her friends. Her dad in particular has been keen on her to 'fit in'. Although at the same time, values individuality. There's something kinda raw about this book and (as an adult) that's something which really struck me. It touches on a lot of themes—everything from families and relationships, to trust, self-esteem and mental health. Author Annabel Pitcher doesn't pull any punches. The behaviour of teens and adults are bared in all of their (sometimes) vicious glory. When Tess Turner learns that the man she thought was her dad isn’t her birth father, she’s shocked into silence. Literally. As she looks into her past, the truth about her real dad may uncover a lot of painful secrets. But when you aren’t talking, it’s easier to keep them. This is a fantastic contemporary coming-of-age novel about the definition of family and identity. Tune in to our weekly podcast dedicated to all things new boo When Tess Turner learns that the man she thought was her dad isn’t her birth father, she’s shocked into silence. Literally. As she looks into her past, the truth about her real dad may uncover a lot of painful secrets. But when you aren’t talking, it’s easier to keep them. This is a fantastic contemporary coming-of-age novel about the definition of family and identity. Every now and again I read a book that even when I don't relate fully with the main character, I end up completely immersed in the story and unable to think of anything else. THIS is one of those books. I had previously read (and loved) Ketchup Clouds, so I was super excited to read more from Annabel Pitcher. And now that I have, I will probably be reading everything she writes, forever ever. The best thing about her books are that they are so full of emotion. She could be writing about something Every now and again I read a book that even when I don't relate fully with the main character, I end up completely immersed in the story and unable to think of anything else. THIS is one of those books. I had previously read (and loved) Ketchup Clouds, so I was super excited to read more from Annabel Pitcher. And now that I have, I will probably be reading everything she writes, forever ever. The best thing about her books are that they are so full of emotion. She could be writing about something I really wouldn't even find sad normally, but her words somehow make my heart ache while reading about it. That's talent my friends. So Tess..... she's not talking. And it's not because she can't. I thought this was going to be a book about a girl that could not speak, not that she would not speak. I guess it could be the same thing-- experiencing a traumatic event that leaves you feeling like you can't speak. Tess knows she can speak though, she just won't. I'm not sure exactly if I was down with all the specifics of that, but I was able to overlook it because the story and characters were so strong. Tess's silence costs her her best (and only) friend. Their separation is what really hurt my heart the most. I loved reading about Tess and Isabel in their better times because they were truly soulmate-type friends-- Tess always says they were symbiotic creatures. It made me wish I had an Isabel of my own :( All the characters around Tess were truly developed. They were real people with good points and flaws.... even the villain of this book had vulnerability. I can't say enough about the range of the people in this book. Why Should You Read This Book? It's about family stuff, but it's SO much more than that. The issue that starts the mutism isn't the biggest/toughest issue I've ever read about, but there are so many other stories involved besides this main issue. There's bullying and body issue stuff-- plus the girl talks to a plastic key chain for much of the book. Where else are you going to read something like that and it makes sense? I actually started viewing Mr. Goldfish as a real live character in this book. It was odd. OVERALL: Another YES for Annabel Pitcher!! I loved this story about a girl going through a tough moment in her life. I know it's classified as YA, but I would totally put this in an in-between MG and YA category. It is definitely do-able for both age groups. Het verhaal was best goed, maar ik vond het zo langzaam lezen. Ik zei al eerder dat de zinnen zo lang waren soms en hier ergerde ik me vaak aan. Ik ben dan ook blij dat ik dit boek eindelijk uit heb. Ook was de verhaallijn soms langzaam naar mijn idee, er gebeurde weinig. Het einde vond ik dan wel weer origineel, maar dat was in mijn ogen weer iets te gehaast. Tess vond ik op een gegeven moment ook vervelend worden. Ik kon me niet erg goed in haar verplaatsen, dat is vast de reden daarvan. Het is Het verhaal was best goed, maar ik vond het zo langzaam lezen. Ik zei al eerder dat de zinnen zo lang waren soms en hier ergerde ik me vaak aan. Ik ben dan ook blij dat ik dit boek eindelijk uit heb. I tried my best, but Silence is Goldfish is 100% not for me. The stream of consciousness narration gives me a headache and it became unbearable for me after 50 pages or so. Definitely not what I expected after reading Ketchup Clouds. Still, if you can handle stream of consciousness, go for it! Different readers have different tastes and all the way my best friend dislikes epistolary novels and I love them.. Le pongo dos estrellas y estoy siendo generosa porque me ha costado la vida terminarlo. 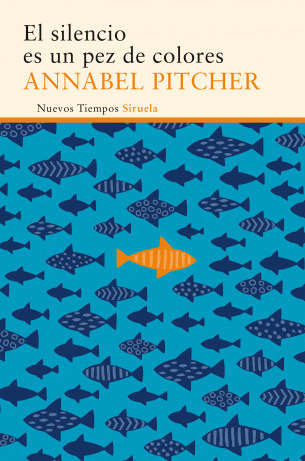 Lo cogí con muchas ganas porque Annabel Pitcher es una de mis autoras favoritas y sinceramente me ha decepcionado un montón. La trama no está mal y me gusta el mensaje y todo lo que quiere transmitir la autora con esta historia, pero hay algo con lo que no pude: la protagonista. Tess es completamente insoportable, entiendo su situación y que sea joven y no sepa manejar muy bien el shock por lo que ha descubier Le pongo dos estrellas y estoy siendo generosa porque me ha costado la vida terminarlo. Lo cogí con muchas ganas porque Annabel Pitcher es una de mis autoras favoritas y sinceramente me ha decepcionado un montón. La trama no está mal y me gusta el mensaje y todo lo que quiere transmitir la autora con esta historia, pero hay algo con lo que no pude: la protagonista. Tess es completamente insoportable, entiendo su situación y que sea joven y no sepa manejar muy bien el shock por lo que ha descubierto, pero madre del amor hermoso... La lectura se me hizo muy cuesta arriba por su culpa, su egoísmo y sus tonterías de niña caprichosa pudieron conmigo. Es cierto que al final hay un cambio en ella pero para mi gusto tarda mucho en llegar. Una cosa que sí me gustó, a pesar de que en un principio no me convencía, es todo el asunto de Mr Goldfish y como ayuda a la protagonista a lo largo de la historia. De hecho, me mantuve leyendo debido a él, si hubiera sido por Tess habría abandonado la lectura en los primeros capítulos. I couldn’t get into the storing. The 15 year old narrator behaved as if she was 11, I didn’t like the writing or any of the characters. I'm sorry but I didn't get it, like at all. I went into this book thinking it would be one thing and ended up getting something completely different. I'll give it this, the authors writing style is enjoyable. It's easy to read and like and her voice is relatable. But I didn't like her characters. I didn't understand any of them. Tess basically completely lost her marbles and it wasn't presented in any sort of legitimate way that I could see. Her actions were childish and ridiculous and it's anot I'm sorry but I didn't get it, like at all. I went into this book thinking it would be one thing and ended up getting something completely different. But I didn't like her characters. I didn't understand any of them. Tess basically completely lost her marbles and it wasn't presented in any sort of legitimate way that I could see. Her actions were childish and ridiculous and it's another book about a complete lack of communication (which really isn't my cup of tea.) The characters were all far too extreme in one way or another and I was too busy whining and gasping at the insanity of it all to actually enjoy the story. I realise the book is supposed to be about a girl who goes into shock but I really don't think it was presented in any sort of realistic way. It all seemed comedic and juvenile. I've read Ketchup Cloud's by Annabel Pitcher and I enjoyed that one better than this but still didn't love it. I just don't seem to be able to click with any of her characters in any way shape or form. I really wish differently but perhaps her books just aren't for me. I might try one more in the future but I think third time lucky will have to apply, if not I'll be calling it a day with Annabel Pitcher's works. It felt like it took me ages to get into this, so the first bit of it dragged slightly for me. Unfortunately, after It did manage to catch my interest, it wasn't long before the book started struggling to keep it. There wasn't any parts in this that I loved, but it wasn't a bad read overall. Tess toch :/ Boek komt op de te-lezen-plank voor mijn dochter binnen een aantal jaar. El silencio es un pez de colores de Annabel Pritcher. Sabes que estás ante un buen libro cuando las palabras fluyen por tus ojos y la historia no te confunde ni da vueltas: es. La autora nos revela y recuerda la frustración y el miedo que habita cuando eres adolescente,no lo justifica, pero crea una gran historia que sucede en Manchester, Inglaterra que va de una chica de secundaria quedejar de hablar como un signo de protesta. Silence is Goldfish is about a 15 year old girl called Tess who just finds out that her dad isn’t her real dad, and her anger/frustration causes her to become reluctant to speak. We follow Tess’ story as she begins her search to find who her real dad actually is.. It took me a while to get into this book. I got quite lost during the beginning because there was so much going on at once. However the further I read, the more I loved it! Silence is Goldfish is a different approach to a YA book, full Silence is Goldfish is about a 15 year old girl called Tess who just finds out that her dad isn’t her real dad, and her anger/frustration causes her to become reluctant to speak. We follow Tess’ story as she begins her search to find who her real dad actually is..
Het duurde even voor ik in dit boek geraakte, want ik had schrik. Schrik dat het hele verhaal zou eindigen met een "jamaar, het was een misverstand! Het blogbericht was nog niet afgewerkt!" en alles zou weer peis en vree zijn. Een F.C. De Kampioenen plot met andere woorden. Annabel Pitcher besloot gelukkig niet zo'n einde te schrijven. Gelukkig maar. Eens ik in het boek geraakte, las het vlot weg, maar ik had met een aantal zaken wel wat problemen. Haar eerste twee boeken hielden me echt in hun greep en ik leefde helemaal mee met de personages. Met Tess had ik een beetje moeite. Ze beslist niet meer te praten uit protest. Daardoor komt ze in een aantal netelige situaties terecht. Dat zijn uiteraard situaties waar ze niet in had moeten terecht komen had ze haar mond open gedaan. En daar heb ik het zelf heel moeilijk mee. Als er iets is, als je een probleem hebt, praat er dan met iemand over. Het hoeft daarom zelfs niet de persoon te zijn waarmee je een probleem hebt. Dat is 99% van de keren dé oplossing. Niet dat ik altijd even geweldig ben in het opvolgen van mijn eigen raad, maar bon. Daarnaast heeft ze ook duidelijk een obsessieve compulsieve stoornis en een angststoornis. Hoewel het duidelijk is voor de lezer dat Tess hulp nodig heeft, komt dit hulp er nooit. Het verhaal overspant een aantal weken of zelfs maanden en toch komt er nooit echt professionele hulp bij kijken. Er wordt gewacht op een brief van een of andere instelling voor geestelijke gezondheid bij kinderen en jongeren. Gewoon gewacht. Niets meer. En zelfs op het einde van het boek, wanneer alles terug in kannen en kruiken is (min of meer), is er niet iemand die even zegt: "Misschien moeten we toch maar eens informeren naar professionele hulp, want hoewel alles terug in orde lijkt te zijn, heb je ongetwijfeld nog wel een paar zaken waarmee je zit, toch Tess?". Op zich zijn de problemen die Tess heeft met haar eigen geestelijke gezondheid heel goed omschreven en ze komen realistisch over. Ik las achteraf op Goodreads dat Annabel Pitcher zelf ook haar nodige demonen heeft. Ze weet dus waarover ze schrijft en dat merk je wel. Alleen hoe ermee wordt omgegaan vond ik minder. Er zijn genoeg tieners die met van alles en nog wat worstelen en in een boek voor tieners hen dan de boodschap "alles komt wel goed zonder hulp" geven, is misschien niet zo ok.
En goed, ik zit hier nu even af te geven op het feit dat het hulp aspect ontbreekt, maar al bij al vond ik dit wel weer een leuk boek. Annabel Pitcher is een frisse wind in YA voor mij. Daar waar ik anders over ranke, slanke heldinnen lees die hun wereld eigenhandig redden, is Tess een echt meisje met een beetje overgewicht en hoewel ze een goede leerling is, is ze niet bepaald populair. Zo zijn er dertien in een dozijn te vinden. Het gezin dat ze weer neerzet kan eender wel gezin zijn. Een normaal gezin zonder speciale gaven, maar met z'n nodige strubbelingen. Er komt een kus bij kijken, maar geen eindeloos gezwijmel en mensen die eindeloos in elkaars ogen verdrinken. I was sent this book for the Goodreads Giveaways. By the author of Ketchup Clouds and My Sister Lives on the Mantelpiece, Silence is Goldfish is about fifteen-year-old Tess who discovers her father isn't her real father. She starts out by realising what has happened, that she feels she has been living a lie for the past few years, deciding she will pack a few of her things and go looking for her real father, regardless. Tess would love nothing more than to tell her mother how she feels about her recent awful discovery, but she instead holds her disappointment inside, letting it fester away at her. She packs her children's torch, which is in the shape of a goldfish, tissues, two chocolate bars and a magazine and it will be a big leap for her from living in Manchester to going to London. The story's heroine sounds like a female version of Adrian Mole with her trying to find meaning in her teenage life away from home. Jedi the dog and her Star Wars duvet (she has a thing about Luke Skywalker). From the start, Tess takes the reader on a journey through her young life before she leaves for London and after. She has thought of what her father left on his computer that let Tess to her decision to not call him her dad, and leave home as she feels invisible to her parents, especially her mother who rarely spoke to her. She wants to confide in Isabel, her best friend, but she wimps-out every time. The reality of what she viewed on her dad's computer haunts her all the way though. This was such a fast read, I could not put this book down once I started. This is the story of Tess, a fifteen year old teenager, that become a mute once she realizes that the man she thought was her father is actually not her father. Tess becomes mute because she realizes that it is easier to stay silent, than to answer the tough questions she is being asked AND ask the hard questions she wants/needs to ask. Tess sets out on a quest to discover who her biological father is and hopefully discover who she is along the way. Two words that come to mind when I think of this book are: honest and poignant. Tess is such an amazing MC, she is relateable and endearing. A reader will have a hard time not connecting with her immediately. She comes across as a true fifteen year old teenager: struggling to find her place in the world and find a way to fit in. Tess does have her moments when she is annoying, as most teenagers can be, but you still find yourself rooting for her. This story also brought to light the highs and lows of every day family dynamics, bullying, and the people that are usually caught in the middle. It did not shy away from real topics but thankfully it did not overshadow the entire story. Tess is, in fact, bullied in school but you see how she develops into a stronger person as the story continues. I did feel that the plot of the story was a bit rushed in some areas and certain things should have been expanded upon. The ending could have had a little more explanation as it left me with some lingering questions. Please know that these issues did not stop me from really enjoying this story. In this first US printing of a novel published and set in Great Britain, Tess Turner has just accidentally discovered that her father isn't her real dad. And her current dad? If the blog post she stumbled across on his laptop is any indication; hated her from the moment she was born. Adrift in her confusion; 15 year old Tess falls mute. "Speaking" only in her mind to a flashlight she calls "Mr. Goldfish"; we follow Tess through the fallout of choosing to remain silent and then of seemingly being In this first US printing of a novel published and set in Great Britain, Tess Turner has just accidentally discovered that her father isn't her real dad. And her current dad? If the blog post she stumbled across on his laptop is any indication; hated her from the moment she was born. Adrift in her confusion; 15 year old Tess falls mute. "Speaking" only in her mind to a flashlight she calls "Mr. Goldfish"; we follow Tess through the fallout of choosing to remain silent and then of seemingly being unable to speak up. To her parents. To her best friend. To bullies. To the teachers; even the one she feels may be her "real" dad. Her silence leads Tess to learn about herself, admit some truths, find out some really devastating lies that others have been telling; in short she comes of age. This is a really compelling story of betrayal, self-identity, and complicated family relationships as well as friendship. The writing is very enthralling; there is the flow of the plot and Tess' growing silence but also some truly beautifully crafted lines that make you want to re-read them. Anything you didn’t like about it? Things wrap up a bit neatly but it is satisfying after the great build up of tension throughout the story so it still reads well. To whom would you recommend this book? Readers looking for a more modern and arguably more interesting Holden Caulfield. Everyone is a liar, but it takes living in silence (or perhaps just being quiet enough to listen well) to suss out the truth sometimes. Also, anyone who enjoyed the surreal nature of "Calvin" by Martine Leavitt or "Going Bovine" by Libby Bray will be enthralled by Mr. Goldfish. Ik vond dit boek niet zo goed als 'Onder de ketchupwolken', maar aangezien ik dat echt een van mijn lievelingsboeken is, is het misschien niet eerlijk om hem daarmee te vergelijken. Dit boek heeft een heel sterk begin en een prachtig einde, alleen tussendoor dwaalde ik af en toe een beetje af. In dat stuk werd het boek gered door de personages, die echt allemaal iets bijdragen aan het verhaal en ook allemaal heel onderscheidend zijn. En als je me van tevoren had verteld dat een plastic zaklamp i Ik vond dit boek niet zo goed als 'Onder de ketchupwolken', maar aangezien ik dat echt een van mijn lievelingsboeken is, is het misschien niet eerlijk om hem daarmee te vergelijken. Dit boek heeft een heel sterk begin en een prachtig einde, alleen tussendoor dwaalde ik af en toe een beetje af. In dat stuk werd het boek gered door de personages, die echt allemaal iets bijdragen aan het verhaal en ook allemaal heel onderscheidend zijn. En als je me van tevoren had verteld dat een plastic zaklamp in de vorm van een goudvis een van de leukste rollen heeft in dit verhaal, had ik je nogal ongelovig aangekeken, maar: het is waar. I found this compulsively readable, even though I didn't really like what I was reading. Tess's voice in this was possibly too realistic, i.e. she's a whiny teenager and she doesn't hold back on her whine. Her immaturity and the way she leapt to conclusions was intensely frustrating. I was also left feeling unsettled by the fact that the severe bullying that goes on during the book is never actually addressed or resolved. Now I've got the full text! After reading the whole novel, this still remains a three stars read for me. Tess grew on me, and it was a good attempt to look at family relationships and how you come to terms with growing up/finding yourself. A little earnest for my tastes. This book is a lovely story in which a girl finds out a terrible secret she then goes completely silent to avoid being hurt again. In her silence she meets heaps of people who change her perspective on the secret. I recommend this book to both boys and girls. Ages 11 and up. Great book! Heel mooi boek over anders zijn en het zoeken naar je identiteit! All her life, Tess has been trying to fit in, saying and doing whatever her parents and teachers wanted to hear - until she sees something she wasn't meant to, a blog post by her dad from which she learns that he's not her dad at all and apparently didn't want her, either. The revelation turns her world upside down, and in response she stops speaking entirely, leaving everyone around her puzzled and concerned while she also tries to find out who her real father might be. This took me quite a whil All her life, Tess has been trying to fit in, saying and doing whatever her parents and teachers wanted to hear - until she sees something she wasn't meant to, a blog post by her dad from which she learns that he's not her dad at all and apparently didn't want her, either. The revelation turns her world upside down, and in response she stops speaking entirely, leaving everyone around her puzzled and concerned while she also tries to find out who her real father might be. Annabel Pitcher studied English at Oxford and has since worked as a script writer and an English teacher. She lives in Yorkshire with her husband. MY SISTER LIVES ON THE MANTELPIECE was her first novel. She is a full-time writer.